Two earthquakes struck in the Irish Sea early Sunday, said the British Geological Survey. The strongest shock measured 3.3 on the Richter scale at a depth of about 5km some 25km off the coast of Blackpool at 10.58am (BST), and was reportedly felt by people on the British mainland. An earlier quake measuring about 2.4 magnitude at a depth of 3km occurred about 4 hours earlier. “The Irish National Seismic Network , which monitors seismic activity, has said that today’s earthquakes were ‘most likely the result of glacial rebound, the process whereby stresses built up the weight of glaciers from the last Ice Age are slowly released,'” said a report. A magnitude 4.0 quake struck the Iceland Region (62.90°N, 25.18°W) on Sunday at 07:00 UTC. Local geologists would be advised to investigate connection between those quakes. FIRE-EARTH models suggest a Mega Quake could strike the region in the next few weeks with a probability of about 70 percent. Solomon Islands government has declared a State of Disaster for Santa Cruz Islands after a meter-high tsunami triggered by a magnitude 8.0 quake engulfed the region on Wednesday. At least nine people are dead and many are missing after the tsunami damaged or destroyed more than 20 villages. Officials say scope of the disaster is much worse than initially thought and they still don’t know the fate of the more outlying villages in the reef islands. The tsunami has wept away entire villages, spreading debris everywhere. “The force behind the meter-high [tsunami] wave swept everything in its path, especially in low-lying areas,” said an official. Authorities say about 7,000 people have been displaced as a result of the tsunami, but the number could reach much higher. More than 150 aftershocks have rocked the Santa Cruz Island region following the main shock that struck on Wednesday, February 06, 2013. A 6.6Mw aftershock struck about 36 km (22 miles) SSW of Lata, Solomon Islands at a depth of about 10km on Thursday, February 07, 2013 at 18:59:16 UTC, USGS/EHP reported. The quakes struck near the city of Tabriz (pop: ~1.5 million), capital of East Azerbaijan province and the country’s fourth most populated city, destroying or damaging about 70 outlying villages. 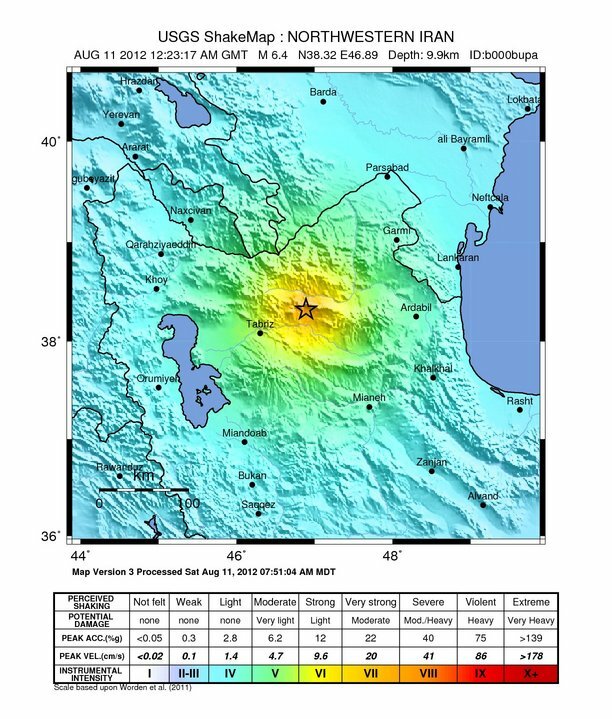 First quake measuring 6.4Mw struck 20 km (12 miles) WSW of Ahar, and 60 km (37 miles) ENE of Tabriz, Iran. 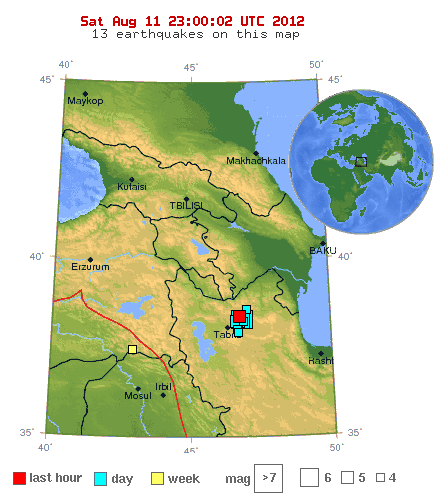 Second quake measuring 6.3Mw struck 32 km (19 miles) WSW of Ahar, and 48 km (29 miles) ENE of Tabriz, according to USGS. Both quakes struck at depths of less than 10km. The second quake struck about 12 minutes after the first at 12:34UTC, August 11, 2012. The death toll is expected to rise, as many people are still trapped in the rubble, officials told reporters. At least a dozen aftershock have struck near the epicenter at Armenia-Azerbaijan-Iran border region, as of posting. The earthquake was epicentered at 2.348°N, 93.073°E and occurred at a depth of 32km, according to USGS. Internet Intensity Map. (Source USGS). 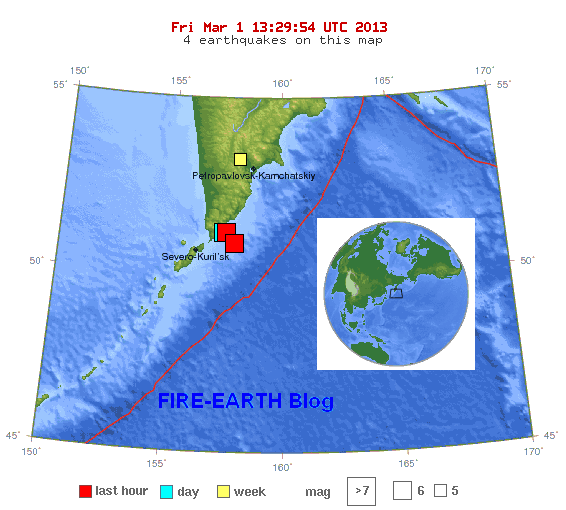 FIRE-EARTH Models show a large earthquake measuring up to 8.3Mw could strike within a 50-km radius of Iwaki, Japan. Death toll from the quake has reached at least 75 with up to 150 people injured, according to various reports. “The quake also destroyed 390 residential houses, 14 monasteries and 9 government department buildings in the mainly affected areas of Tachileik, Tarlay, Naryaung and Monglin.” Xinhuanet said. Original caption: “The video image taken from the telecast of Myanmar Radio and Television (MRTV) on March 25, 2011 shows a big crack on a road damaged in an earthquake in Myanmar’s northeastern region.” Via xinhuanet. NEXT MAJOR TECTONICS EVENT COULD OCCUR IN THE U.S.
Based on their Earth Model, FEWW Moderators believe the world’s next catastrophic tectonics event could occur in western United States with a probability of 0.74. THE WORLD’S NEXT MAJOR DISASTER COULD OCCUR IN THE U.S. US Volcanoes: Blasts from the Past? Fire Earth Model shows that Japan region could be struck by up to 4 additional strong to large earthquakes possibly this year/early next year, one of which could be a catastrophic event. FIRE-EARTH forecasts intense seismic activity in Japan Region during the 2011 – 2015 period. The shock was the largest of a cluster of about a dozen tremors which have struck the area in the last couple of weeks. The quake struck at a depth of about 4km some 59 km (37 miles) north of Little Rock, AR. EQ Location Map. Source ANSS via USGS. Map enhanced by FIRE-EARTH. A VOLCANIC ERUPTION IN ARKANSAS? “…On the third day of December last, a singular noise was heard here. It has been differently described by those who heard it as like a blast in a wall, the explosion of a meteor, or a single distant clap of heavy thunder. So far as ascertained, the nearer the center or place of explosion, there was a rumbling and a sensible vibration of the earth. “There were no immediate reports of any mortalities in earthquake. However, it is widely believed that a large number of people are trapped under the rubble, and the casualties are expected to be high,” an official said, Press TV reported. Earthquake Location Map. Source: USGS/EHP. Enhanced by FEWW. Building in the rural areas near the epicenter sustained 50 to 80 percent damage, the local governor told news agencies. The Iranian Seismology Center said the quake struck about 7 km (4.3 miles) outside the city at a depth of about 7 km . A magnitude-4.9 quake struck the southern Iranian port city of Bandar Abbas, injuring more than 700 people, the report said. “In 2008, a strong earthquake measuring 6.1 in magnitude struck in Hormozgan, demolishing nearly 200 villages and killing at least six people,” a report said. In 2003 a 6.7Mw quake struck near the city of Bam in Iran’s Kerman province killing about 25,000 people. Latest Earthquakes Magnitude 5.5 + (Click Link for FEWW Forecast). The earthquake, which was epicentered at 7.748°N, 91.938°E and at a depth of about 35km, some 155 km (95 miles) W of Mohean, Nicobar Islands, India, occurred on Saturday, June 12, 2010 at 19:26:50 UTC, USGS/EHP said. 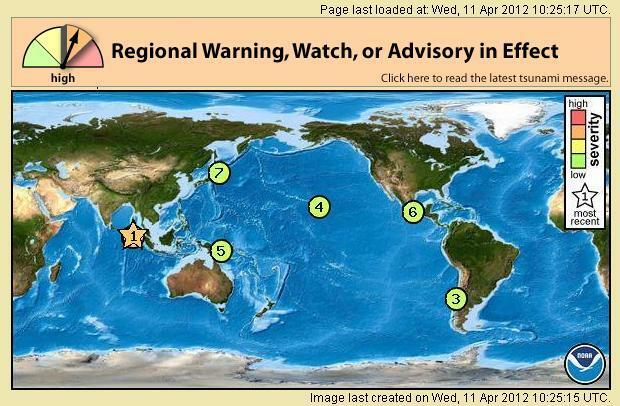 The Pacific Tsunami Warning Center (PTWC) initially issued a Tsunami Warning for the entire Indian Ocean, but later downgraded the warning to India region only, and later canceled the alert. “Sea level readings indicate that a significant tsunami was not generated,” PTWC said. So far no damage has been reported in the Andaman and Nicobar islands regions, however a total blackout was reported the capital, Port Blair, news reports said. The mainshock was followed by at least two significant aftershocks, with the larger one measuring 5.5Mw, as of posting. 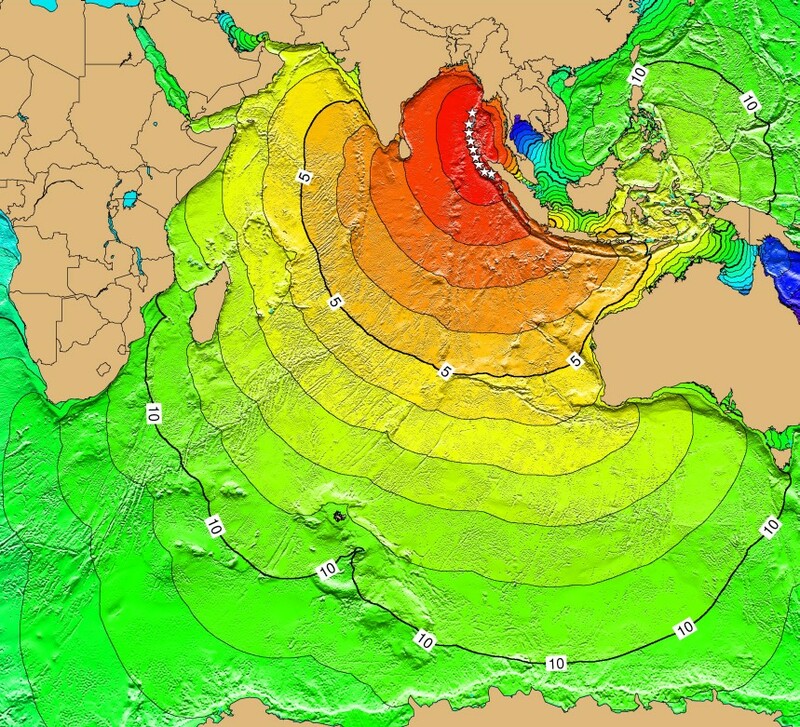 The quake occurred about 660km NNW of the 9.2Mw Indian Ocean quake which occurred in December 2004, triggering the deadly Boxing Day Tsunami. EQ Location Map. Source: USGS/EHP. Map enhanced by Fire-Earth. To most people in the southwestern U.S., the April 4 El Mayor-Cucapah earthquake felt like a rocking of the ground. But on a group of inch-long fish that exist nowhere else on Earth outside of “Devils Hole,” a crack in the ground in Nevada’s Mojave Desert, it unleashed a veritable tsunami. The event provided the researchers with a rare opportunity to study how a critically endangered species copes when its confined habitat is shaken up in a dramatic way. 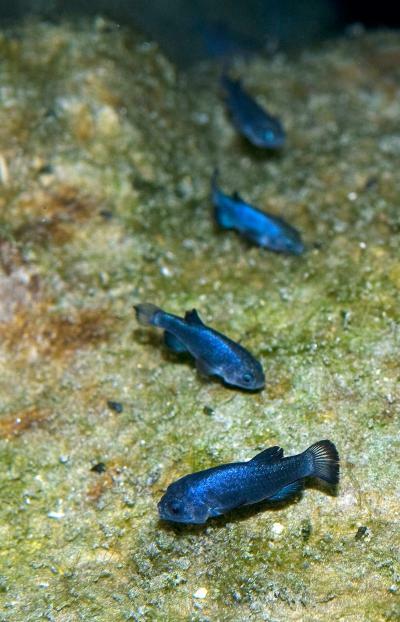 The Devils Hole pupfish spend their lives in what likely is the “smallest habitat of a vertebrate species,” according to UA professor Scott Bonar, who runs a pupfish population recovery program at UA’s School of Natural Resources and the Environment. That habitat is the “spawning shelf” – a submerged rock surface covered by a mere two feet of water. It’s here that the pupfish feed and go about their breeding activity. The shelf forms the only shallow part of a freshwater pool measuring 10 by 50 feet that marks the entrance to the Devils Hole cave. The pool provides a window into the extensive carbonate aquifer within the Amargosa Valley groundwater basin. Despite explorations undertaken by cave divers, no one has been able to probe the depths of the Devils Hole cave system, although they are known to plunge beyond 500 feet. On most days, Devils Hole looks like a glassy surface of crystal-clear water, shimmering with an unearthly, iridescent turquoise hue at the bottom of a crack in the rocks 50 feet below ground level. But on April 4, 16 minutes after the shockwaves arrived in the Mojave Desert 300 miles north of the epicenter near Mexicali in Baja California, serenity gave way to turmoil in the small world of the Devils Hole pupfish. “The water was sloshing back and forth so hard it splashed against our cameras four feet above the waterline,” said Ambre Chaudoin, a graduate student in fisheries conservation and management with the U.S. Geological Survey (USGS) Arizona Cooperative Fish and Wildlife Research Unit at the UA. 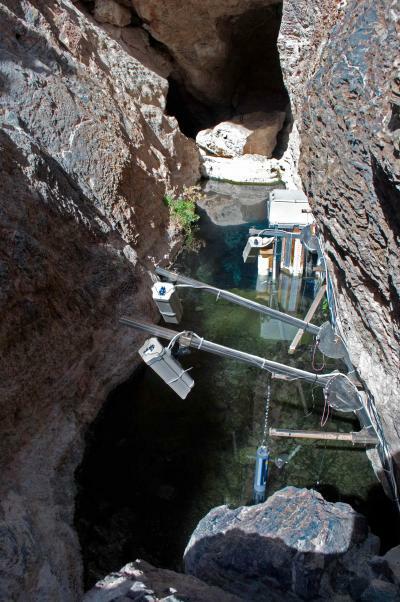 Chaudoin and fellow USGS researcher Olin Feuerbacher, a senior research specialist for the Cooperative, conduct the pupfish monitoring study as part of a joint effort to protect the Devils Hole pupfish population. Under its land grant mission, the UA is tasked with research aimed to learn how the fish might be propagated in captivity and what factors may threaten their survival as a species. The study is being conducted by the USGS Arizona Fish and Wildlife Cooperative Research Unit and is funded by the U.S. Fish and Wildlife Service, in partnership with the National Park Service and the Nevada Department of Wildlife. Devils Hole pupfish numbered about 400-500 until the late 1960s, when the water level in the pool dropped in response to pumping of nearby irrigation wells. Only a U.S. Supreme Court order prevented the shallow spawning shelf from falling dry, thus saving the species from extinction. Since then, the Devils Hole pupfish have struggled to survive. Chaudoin and Feuerbacher make the trip from Tucson to Devils Hole twice a month to check on the measuring equipment and download data. They happened to be on location conducting pupfish behavior surveys the day of the April 4 earthquake. Just 10 minutes before the quake struck, they had reconnected the video cameras to their recording position inside the pool. “The fish begin to move out of the camera’s view as the waves start getting bigger, and then, because of all the sediment being stirred up, you can’t see the fish. As the waves grew stronger, the fish likely moved into deeper waters,” Chaudoin said. To see video clips, visit the U.S. Geological Survey website. Although the violent sloshing during the quake washed away algae that are essential to the food web of the critically endangered fish, algae have already grown back substantially, according to biologists. Disentangling the complex interactions between environmental factors and the pupfish’s behavior is not a simple task. It appears a combination of several factors, such as oxygen concentration in the water, temperature and length of daylight, all interact to trigger spawning behavior. In fact, he added, after the April 4 Mexicali quake, the National Park Service recorded a slight increase in larval abundance as compared to a similar survey a few weeks before the earthquake occurred. Federal and state surveys done within a week after the earthquakes revealed about 118 fish in the pool, compared to about 70 the year before. Also, biologists saw newly hatched larval fish and evidence that the fish were spawning. Despite increasing numbers, the population is still critically endangered, mostly because no fish exist outside of Devils Hole. In 2006, the population plummeted to a critical low of just 38 fish. Chaudoin and Feuerbacher do not like to speculate but they are intrigued by the idea that disturbance might play an important role in triggering or influencing the fish’s spawning behavior. Chaudoin is investigating this question in a side project. One of the questions the researchers are hoping to answer is whether natural disturbances, such as earthquakes, are a threat or a boon to the pupfish population. Serial No 1,714. Starting April 2010, each entry on this blog has a unique serial number. If any of the numbers are missing, it may mean that the corresponding entry has been blocked by Google/the authorities in your country. Please drop us a line if you detect any anomaly/missing number(s). About 11,744 have been injured, Xinhua news agency reported rescue team officials as saying. Children, showing early signs of frostbite on their faces, prepare to sleep in the open in sub-zero temperatures at a square in Tibetan Autonomous Prefecture of Yushu, northwest China’s Qinghai Province, April 15, 2010. (Xinhua/Li Ziheng). Image may be subject to copyright. An estimated 15,000 homes have been destroyed in Yushu county, leaving 100,000 people homeless, many of them having to sleep in the open in sub-zero temperatures, in the remote high altitude region, which lies at about 4,000m (13,000ft). Some 500 interpreters have been sent to the quake-stricken region because 97 percent of the Yushu population are ethnic Tibetans. The 7.0 to 7.1Mw quake, which struck on April 14, 2010, destroyed homes, schools and other public infrastructure. It knocked out power lines and triggered landslides, blocking roads and access routes. Serial No 1,584. Starting April 2010, each entry on this blog has a unique serial number. If any of the numbers are missing, it may mean that the corresponding entry has been blocked by Google/the authorities in your country. Please drop us a line if you detect any anomaly/missing number(s). 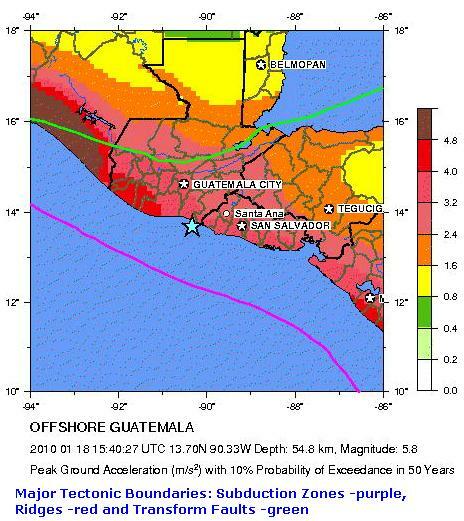 Strong earthquake measuring as large as 6.1Mw struck south of Guatemala about 85 km (55 miles) WSW of Santa Ana, El Salvador and 105 km (65 miles) SSE of GUATEMALA CITY, Guatemala, at a depth of about 50km on January 18, 2010 at 15:40 UTC. This quake may (have) cause (caused) landslides in the mountainous regions of both El Salvador and Guatemala, which have not yet been detected (reported). The quake was not large enough, and struck deep, to create a tsunami. The earthquake shook the buildings in El Salvador capital city of San Salvador causing panic among the residents, but did not cause any damage, according to Latin Press. “We felt a tremor that was a bit strong. We are monitoring the area but there is no damage here. It was a light movement that lasted for a few seconds,” said a tourism official from the Guatemalan tourist office in Puerto Quetzal, on the country’s south coast, according to Reuters. A powerful earthquakes measuring up to 6.7 Mw struck offshore Tarapaca, Chile about 95 km (60 miles) south of Arica, Chile at an estimated depth of 10 km on Friday, November 13, 2009 at 03:05:55 UTC. This event occurred about 29 km north-northeast of another strong quake measuring at least 6.0 Mw that struck the area on April 17, 2009. As of posting there were no report of damage in the area. However, earthquakes of this size sometimes generate local tsunamis that can be destructive along coasts located within a hundred kilometers of the earthquake epicenter. Authorities in the region of the epicenter should be aware of this possibility and take appropriate action. More on this quake as additional information become available. A powerful quake measuring up to 7.3 Mw struck Fiji at 17.212°S, 178.413°E or about 100 km north of the capital, Suva and at a depth of 585 km on Monday, November 09, 2009 at 10:45 UTC. The mainshock was followed by at least one aftershock measuring 5.3 Mw. Following the powerful 7.8 magnitude earthquake that struck the tip of the Fiordland, South island, New Zealand, followed by a large cluster of aftershocks, another round of geo-assault appears to be gearing up at the southern end of the Kermadec trench. The Fiordland quakes occurred as a result of a large reverse faulting motion caused by the subduction of the Australian subplate under the Pacific plate, on which Fiordland rests, in Puysegur Trench, at the Alpine Fault. The new wave of earthquakes would instead be caused by the ‘mirror image’ action, with Pacific plate subducting beneath the Australian protoplate. A magnitude 6.3 earthquake that struck south of the Fiji Islands on August 18, 2009 at 21:21 UTC may herald a new round of intense [and unprecedented] seismic activity at Kermadec Trench to the north, NE, and East of the North Island, as well as the north, NE, and east of the South Island, New Zealand. NOAA Pacific Tsunami Warning Center reported NO destructive tsunami as a result of this event. Powerful earthquake measuring up to 7.0Mw struck Indonesia’s Sumbawa region, about 77 km east of Tambora volcano and at an estimated depth of 18 km, November 8, 2009 at 19:41 UTC. Mount Tambora’s 1815 eruption (Volcanic Explosivity Index of 7) was the largest in modern history, and perhaps the deadliest of all time, with up to an estimated 100,000 people losing their lives as a result. Alarmed by its findings concerning the prospect of intense seismic activity in the region, FEWW featured Mt Tambora in its weekly volcano watch VolcanoWatch Weekly dated 23 July 2009. FEWW Moderators believe that further, intense seismic activity would most likely occur in the region in the near future. A destructive widespread tsunami threat does NOT exist based on historical earthquake and tsunami data. However – there is a very small possibility of a local tsunami that could affect coasts located usually no more than a hundred kilometers from the earthquake epicenter. Authorities in the region near the epicenter should be made aware of this possibility. Earthquakes occur in SFB because of geological faults: San Gregorio fault, San Andreas fault, Mt Diablo fault… and Hayward fault. Oil spills occur there as a result of oil companies faults: Arco’s fault, BP’s fault, Chevron’s fault, ConocoPhillips’s fault, Exxon’s fault… and Shell’s fault! You’d forgiven for thinking there must be an oil spill and an earthquake in the SFBA each day! Because you’d almost be right. The oil slick from the Dubai Star, an oil tanker located at Anchorage 9 south of the San Francisco-Oakland Bay Bridge. Photo: KGO-TV/ABC7 via Mercury News. Image may be subject to copyright. The latest spill, a blackish filthy brown slick of bunker fuel, covered a 250-meter by 4-km stretch of San Francisco Bay on Friday, caused by a “refueling mishap” between an oil tanker, Dubai Star, and a service barge alongside, the U.S. Coast Guard reported. The slick has not reached land and is in a narrow band because there is little wind and much of it may burn off amid warm weather, giving clean-up crews the upper hand in containing it, Coast Guard Captain Paul Gugg told reporters at a press conference. “The weather is very cooperative. We’re all over it.” Gugg said. Gugg said the scope of the contamination does not compare to the massive spill in 2007 of fuel oil from another tanker in the San Francisco Bay that spread across its shores and killed thousand of birds. However, Gugg didn’t say how much bunker fuel had spilled into the bay. The spill comes eight days before the two-year anniversary of the vessel Cosco Busan striking the Bay Bridge in dense fog, ripping open its hull and spilling more than 53,000 gallons of fuel oil that fouled much of the shoreline along the well-known California waterway. The Busan spill killed more than 2,500 birds and deposited oil on 200 miles of coastline, Pacific Environment was quoted as saying. The unscrupulous oil giant BP has been fined $87 million for failing to remove safety hazards at its massive Texas City refinery, the 3rd largest in the US, where an explosion in 2005 killed 15 workers and injured 180 others. The Occupational Safety and Health Administration (OSHA) cited 270 violations at the oil refinery, officials said. “Lawyers acting for victims of the disaster suggested that the renewed action could put BP in breach of a plea agreement two years ago in which it pleaded guilty to a single felony and paid $373m to settle a string of criminal charges.” UK’s Guardian reported. The quake struck about 18 km WSW of another strong quake which struck the region a week ago. A powerful earthquake measuring up to 7.3 Mw struck Banda Sea about 40 km WNW of Serua volcano and 65 km south of Manuk volcano, on Saturday, October 24, 2009 at 14:41 UTC. The quake occurred at 6.161°S, 130.346°E, some 230 km NNW of Saumlaki, Tanimbar Islands, Indonesia, at a depth of about 140 km. It was followed by a moderate quake measuring up to 5.3 Mw, which struck at 6.749°S, 131.601°E, on Sunday, October 25, 2009 at 00:35:06 UTC. On February 21, 1938, a large quake measuring M 8.5 struck about 185 km northeast of Saturday’s quake at a depth of 25km. Based on an analysis of seismic activity in the region, FEWW Moderators believe a large earthquake measuring up to M 8.6 could strike Banda Sea in the next 3 – 6 months. Additional events measuring 6.0 to 7.6 Mw could also be expected in the region, anytime. This earthquake was located too deep inside the earth to generate a destructive tsunami in the Indian ocean, NOAA PTWC said. An earthquake measuring as strong as 6.5Mw struck the Hindu Kush region, shaking northern Afghanistan and Pakistan early Friday, local time. The epicenter was located at 36.471°N, 70.925°E in the Hindu Kush mountain range about 75 km (50 miles) SSE of Feyzabad, Afghanistan, striking at a depth of about 197 km. There have been no immediate reports of casualties or structural damage, however, news from the remote mountainous areas may take some time to reach the outside world.. However, frightened locals were reportedly seen escaping into the open areas in Islamabad, Lahore, Peshawar and Rawalpindi and other major cities in the region. A news report said buildings in Kabul (the Afghan capital) shook during the earthquake. More than a dozen EQs measuring 5.0 to 6.0 Mw have struck the immediate region since August 2008. The latest quake occurred about 240 km southeast of a major quake measuring more than 8.0Mw, which struck the region 102 years earlier almost to the date, on October 21, 1907 at 04:23 UTC at a depth of 35 km. Magnitude 6.1, 25 March 25, 2002 at 14:56:33 UTC; Location 36.06N 69.31E; Depth 8.0 kilometers – Distances 160 km (100 miles) SW of Feyzabad, Afghanistan; 170 km (105 miles) SE of Shaartuz, Tajikistanl; 170 km (105 miles) N of KABUL, Afghanistan; ; 210 km (130 miles) NNW of Jalalabad, Afghanistan. Magnitude 7.4, March 3, 2002 at 12:08:19 UTC; Location 36.50N 70.48E; Depth 225.0 kilometers – Distances: 65 km (40 miles) S of Feyzabad, Afghanistan; 150 km (90 miles) SW of Khorugh, Tajikistan; 150 km (95 miles) WNW of Chitral, Pakistan; 250 km (155 miles) NNE of KABUL, Afghanistan. Magnitude 7.8, March 14, 1965 AT 15:53:06 UTC [NO FURTHER DETAILS AVAILABLE.] Remarks: Two people were injured at Peshawar, Pakistan. Slight damage occurred in Afghanistan and western Pakistan. The shock was felt as far away as New Delhi, India and Tashkent, Uzbekistan (Uzbek SSR, USSR). Further seismicity in the region should be expected in the coming days and weeks. An earthquake measuring up to 8.4 may occur in the region with a probability of 60 percent. Strong earthquake measuring about 6.4 Mw struck Sunda Strait about 180 km WSW of JAKARTA, island of Java, Indonesia, at a depth of about 55km on Friday, October 16, 2009 at 09:53 UTC. Some buildings in the capital, Jakarta, were reported as swaying by the officials. So far there are no reports damage or casualties. A magnitude 7.9 quake, which struck southern Sumatra on September 30, left up to 1,200 people dead. The quake shook buildings as far away as Jakarta, causing some people to leave their homes and offices. (Photo: Amee Enriquez, JG). Image may be subject to copyright.